The Simultaneous (Simul) Game Window looks a bit different to the normal Game Window. As it is a simul, you will be playing more than one opponent at once. The default number of opponents is three, but you can change this using the Add and Remove buttons. To get a complete view of your opponents you may wish to expand the game window. To do this click on the bottom right corner of the window and drag it downwards. As with a normal game, you can use the H and K buttons to adjust the handicap and the komi. 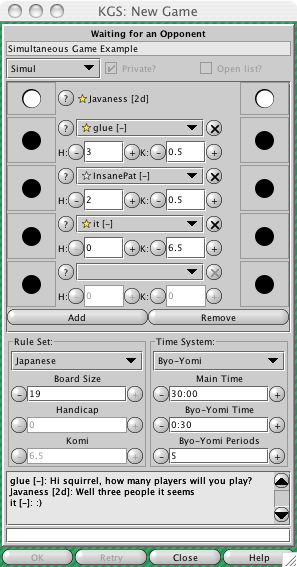 A challenging player may set their own preferences for handicap and komi, however the creator of the simul game can adjust these himself after everyone has challenged. Press OK to accept the challenges. If the players do not like the conditions you can press RETRY and have another go. If you wish to swap opponents press the Down Arrow to the right of the players' names, this will display the complete list of challengers from which you may select your chosen opponent.